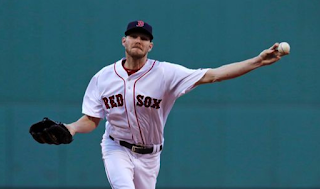 Chris Sale did not get his MLB record ninth straight game with ten strikeouts (he ended up with six), but he and his team won, 9-4 over Texas. The lefty ended up going 7.1 innings and giving up just three earned runs for his fifth victory of 2017. The Sox trailed 3-1 before exploding for seven runs in the seventh inning—keyed by Dustin Pedroia's two-run double that got the ball rolling. One out singles by Andrew Benintendi and rookie Sam Travis set the stage, then both Mitch Moreland and Josh Rutledge also singled. The Carmine Hose have now won three straight and look to Drew Pomeranz tonight to keep it going.